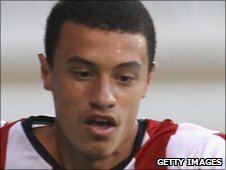 AFC Wimbledon have signed Brentford winger Kirk Hudson on loan for the season and utility man James Mulley on non-contract terms. Hudson, 24, joined the Bees in the summer from Aldershot, but has made just four substitute appearances. He told the Dons website: "I am delighted to be joining another team which plays attacking football and I just can't wait to be playing again." Mulley, 22, left Hayes & Yeading in the summer and had been at Chelmsford. Both players could face Hayes & Yeading on Saturday. Dons boss Terry Brown said: "I had the pleasure of signing Kirk from Celtic as a young man at Aldershot where he contributed 14 goals in their promotion season and I believe he has the winning credentials to help us in our own push for the league. "Kirk is a very talented forward whose strengths are his pace and his finishing and having worked with the boy, I know he will add to what is already a very good dressing room. "Although he hasn't played a lot of football recently we look forward to giving him some game time against Hayes." Brentford boss Andy Scott told his club's website: "The first six months of his Brentford career saw him develop physically but with the number of reserve games we have had postponed we felt it important he develop still further. "The opportunity to do so at the Conference leaders was felt to be ideal. This will help him develop and will give him a good chance to play games, enabling us to monitor his progress whilst we will keep him involved with our squad throughout."